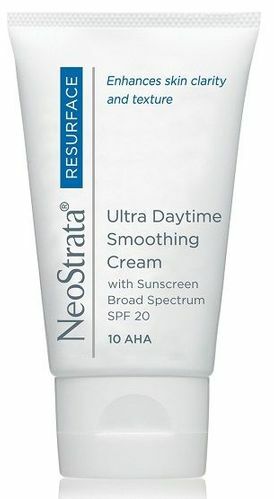 NeoStrata Resurface Ultra Daytime Smoothing Cream Sunscreen SPF 20 1.4 fl oz. Home/NeoStrata/NeoStrata Resurface Ultra Daytime Smoothing Cream Sunscreen SPF 20 1.4 fl oz. Resurface skin with this antiaging face cream ideally suited for first time AHA users to target photoaging skin. 86% noted improved skin smoothness and rejuvenation after four weeks of twice daily use. Encourage cell renewal and fade signs of aging; Reduce the appearance of fine lines and wrinkles as it diminish the look of hyperpigmentation for a youthful, radiant complexion. Reduces skin inflammation while moisturizes and soothes skin. Apply to the face and neck daily for two weeks and twice daily thereafter, after cleansing, as tolerated. Daily use of a sunscreen with this product is recommended. Aqua (Water)​,​ Glycolic Acid​,​ Cetearyl Alcohol​,​ Ceteareth-20​,​ Decyl Oleate​,​ Isopropyl Palmitate​,​ Citric Acid​,​ Propylene Glycol​,​ Isocetyl Stearate​,​ Arginine​,​ Isostearic Acid​,​ Ammonium Hydroxide​,​ Dimethicone​,​ Magnesium Aluminum Silicate​,​ Dicetyl Phosphate​,​ Ceteth-10 Phosphate​,​ Shea Butter (Butyrospermum Parkii)​,​ Phenoxyethanol​,​ Butylene Glycol​,​ Glycerin​,​ Xanthan Gum​,​ Disodium EDTA​,​ Chlorphenesin​,​ Methylparaben​.